Instructor training - Learn cave diving... Become a cave diver or CCR cave diver in North Central Florida. Join us for cave diver training or guided cave dives in the North Florida Springs and Caves. Learn cave diving... Become a cave diver or CCR cave diver in North Central Florida. Join us for cave diver training or guided cave dives in the North Florida Springs and Caves. WDT is IANTD and NSS/CDS affiliate. We organize IANTD Instructor Development Programs and Instructor Evaluation for Cavern, Intro-Cave, CCR Cave Instructor. We also provide NSS/CDS Instructor Sponsor programs. Please consult us for prerequisites. This Program is designed to develop qualified IANTD Cavern Diver Instructors. Must be qualified as an IANTD EANx Instructor in Active Teaching Status, with proof of a minimum of 150 logged dives. Must be qualified as an IANTD Cave or equivalent (BSAC, NACD, CDAA, NSS/CDS). Must provide proof of a minimum of 100 logged cave dives . Must be recommended by a Cavern Instructor, after having assisted in a minimum of at least 2 Cavern Program. Must be a minimum of 18 years of age. This Program is designed to provide quality training to divers advancing into introductory cave diving. Must be qualified as a Cave Diver. Must be qualified as an Overhead Environment Instructor in Active Teaching Status, who has taught a minimum of 3 Cavern Diver Programs and has proof of a minimum of 100 logged cave dives. Must provide proof of a minimum of 300 logged dives . Must be recommended by a Cave Instructor, after having assisted the Instructor in one (1) or more Introductory Cave Diver Programs until the Instructor is confident the student is capable of attending an IEC. The candidate must assist in one (1) complete Introductory Cave Programs. 5. Must be a minimum of 21 years of age. 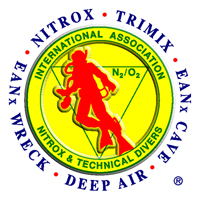 This Program is designed to develop competent Instructors for teaching the safe usage of EANx mixtures while cave diving. The Candidate must be qualified as an IANTD Advanced EANx Instructor in Active Teaching Status and qualified as an IANTD Technical Diver and IANTD Cave Diver or IANTD Technical Cave Diver or equivalent. Must have taught a minimum of 10 IANTD course which may include-Open Water (Nitrox) and IANTD Advanced Open Water IANTD EANx Diver, IANTD Advanced EANx Diver and IANTD Deep Diver Programs. Equivalent programs with any qualification agency may be counted. Must have worked with and been evaluated by a cave Instructor in at least two (2) cave courses. Must be a minimum of 21 years of age. Must be a qualified Introductory Cave Instructor. Must have taught a minimum of three (3) IANTD Introductory Cave Diver Programs. Must provide proof of a minimum of 350 logged dives, of which at least 150 cave dives. This Program is designed to develop competent Instructors for teaching the safe usage of Rebreather while cave diving. Must be qualified as an IANTD Rebreather Instructor in Active Teaching Status and qualified as an IANTD or NSS/CDS Rebreather Cave Diver. Must have taught a minimum of three (3) IANTD Rebreather Diver Programs. Must provide proof of a minimum of 200 dives and 150 logged cave dives of which 50 must have been on a Rebreather. Must have worked with and been evaluated by a cave Instructor in at least two (2) cave courses. One of which can be in conjunction with the IEC. 5. Must be a minimum of 21 years of age. or Must be a qualified Technical Cave instructor and Rebreather Instructor. 2. Must have taught a minimum of three (3) IANTD Cave or Technical Cave Diver Programs. 3. Must provide proof of a minimum of 20 Rebreather Cave Dives and complete a crossover evaluation by a Rebreather Cave IT. 1. IANTD Cave Diver Instructor Kit OR IANTD Technical Cave Diver Instructor Kit. IANTD Instructor manual, IANTD overhead student manual, IANTD Encyclopedia, NSS/CDS workbook, NSS/CDS cavern manual. 2. All students must be taught the concept of gas matching. 3. All bottom mix tanks must be equipped with dual-outlet manifold valves. Independent cylinders may be used when configured as side mounts or back mounts for sump diving only. 4. A stage decompression cylinder containing oxygen or an EAN mixture with at least 50% oxygen, and appropriately labeled. (Technical Cave Diver Program only). 5. An optional EANx stage cylinder containing a minimum of 50 cubic feet (1,400 free liters) of gas may be used for overhead penetration at the Instructor's Trainer discretion. 6. Two (2) Primary regulators must provide ample gas flow. One second-stage hose must be at least 7 feet (2 meters) in length. 7. Each gas source must have its own dedicated submersible pressure gauge. 8. A primary BCD is required. Back flotation is recommended. A backup BCD is required if the student cannot maintain buoyancy in the event of a bladder failure. If a dry suit is used, it may serve as the backup BCD. 9. Dive tables, depth gauge/dive timer and a dive computer. 10. Three reels: one Primary (cave) guide reel and one (cavern or gap) one safety reel. 11. One Primary light and two secondary lights (flashlight type). 12. Three (3) line arrows and cookies. 13. Cutting and backup cutting tool is recommended. 15. Springs on fins are recommended. 1. IANTD CCR Cave Diver Instructor Kit. IANTD Instructor manual, IANTD overhead student manual, IANTD Encyclopedia (Exploration and Mixed Gas Diving Encyclopedia, The Tao of Survival Underwater), IANTD CCR Diver “S” Drill chart C-3401 in addition to “Student Kit”. NSS/CDS workbook, NSS/CDS cavern manual. 2. CCR Must own a CCR. 3. CCR must be equipped with adequate bailout, including out-of-air emergency drills. 4 Two or more Bailout cylinders 40cu/6l with proper stickers labeling.Tanks must be labeled with IANTD stickers or other identification the labels must clearly identify the MOD and oxygen content of the mixture. It is recommended that IANTD labels be used to meet this requirement, in addition to those required by law. 5. Springs on fins are recommended. 6. Two (2) Primary regulators must provide ample gas flow (bail out). 9. Dive tables, depth gauge and dive timer or a dive computer.